Enzymes are a part of every metabolic process in the body – they are also important in the proper functioning of the immune system. Enzymes, or the lack thereof, can be related to almost every known disease. Enzymes not only play a role in digestion, but also during disease and other metabolic processes. Therefore our product Enzyme Boost Formula Capsules. Enzymes are a part of every metabolic process in the body – they are also important in the proper functioning of the immune system. Enzymes, or the lack thereof, can be related to almost every known disease. Enzymes not only play a role in digestion but also during disease and other metabolic processes. Therefore our product Enzyme Boost Formula Capsules. We formulated this enzyme supplement with great care taken with the actual formulation in relation to content and quantities, and have included the following ingredients. It is used to break down amino acids, and make them available to the body, and this important compound is also being used in therapies such as oncology, inflammatory conditions and immune control. It is also valuable in assisting the body to fight infections and onslaughts from viruses, fungi, parasites and bacteria. Protease from aspergillis (Aspergillus Niger / Aspergillus oryzae) may also be able to assist in breaking down dietary proteins and polypeptides which have leaked into the bloodstream as food antigens. A deficiency of this compound can cause anxiety and insomnia, since it will affect the blood alkaline level, and since it is involved in carrying protein-bound calcium in the bloodstream a deficiency may also influence the susceptibility for arthritis, osteoporosis and calcium related diseases. Since protein conversion is necessary for glucose in the body, a problem with protein digestion can lead to hypoglycemia, irritability as well as mood swings. It is used in clearing debris from the blood as well as certain viruses and bacteria, and a shortage of it may result in compromising your immune system or at best decrease your immunity. Symptoms of a shortage can include a variety of symptoms such as constipation, parasites, gingivitis, hearing problems, problems with your back, high blood pressure, gum disorders, insomnia etc. It is required to digest carbohydrates (polysaccharides) into smaller units (disaccharides), and eventually converting them into even smaller units (monosaccharides) such as glucose. Amylase is also involved in anti-inflammatory reactions such as those caused by the release of histamine and similar substances. If your diet is excessively high in carbohydrates, a deficiency of amylase may occur, since this enzyme would be used up by the body at a tremendous rate, and symptoms may include a diversified group of symptoms, which may include a skin rash, depression and mood swings (including PMS), hypoglycemia, allergies, general fatigue, cold hands and feet, inflammation, aches in your shoulders etc. It is also involved in digesting and getting rid of dead white blood cells (a nicer name for pus) and for this reason you might be more prone to abscesses if you are deficient in this enzyme. It is required in the digesting of fats and lipids, and they are more difficult to break down since they have to be carried by a water based transport system – the blood and lymph. Although fat digestion is not concentrated in the stomach, gastric lipase is the digestant to attend to this, and will digest egg yolk and cream, since they are already emulsified fats. In order for fat to be digested properly, the liver starts this process emulsifying the large fat molecules, and bile breaks it down to small droplets, allowing the lipase to start its work. It is required the digestion of milk and milk products. Some people do not produce enough lactase and are often referred to as lactose intolerant, and symptoms may include cramps, gas as well as diarrhea. It has also been suggested that lactose intolerant people have a problem with calcium absorption, and this may also need to be checked, by a lactose intolerant person. If the intestines do not produce enough (or any) lactase, the milk sugar (lactose) is not digested and moves into the colon, where it is fermented by bacteria – producing hydrogen, carbon dioxide and organic acids, which can result in diarrhea, gas and cramps. To test for lactose intolerance, drink two glasses of milk on an empty stomach and watch for any gastrointestinal symptoms. Do the same test but substitute the milk with cheese. If you have any symptoms from the milk, but not from the cheese (which contains very little lactose), you might be lactose intolerant. If you have symptoms from both, it may indicate an allergy to dairy. If you suffer from lactose intolerance, it might be helpful to have a lactase supplement before having any meal containing lactose. When more may be required. A supplement may be beneficial to people suffering from diarrhea, indigestion, heartburn, irritable bowel syndrome as well as sufferers of migraine headaches, since certain studies indicate that migraine sufferers are deficient in lactase. All our organs, tissues and cells are all run by metabolic enzymes, in other words all the processes necessary for life are mediated by enzymes. Minerals, vitamins, and hormones need enzymes to be present in order to do their work properly. Enzymes are the labor force of the body. Enzymes break down toxic substances so that the body can eliminate them without damaging the eliminative organs. Our foods are enzyme-deficient, causing imbalances in our organs, acting as a predisposing cause of disease. Enzymes not only play a role in digestion, but also during disease and other metabolic processes. Because enzymes are a part of every metabolic process in the body – they comprise an important part of the proper functioning of the immune system. Enzymes can be related to almost every known disease. Enzymes act as scavengers in the body. It was previously thought that the pancreas produced all of these enzymes, it is now known that the pancreas could not produce the volume and variety of enzymes required by the body. Enzymes are used up daily in the process of digestion and are lost in the sweat, urine and feces. It is important to remember that enzymes in raw food aid in the digestive process and that their action removes the stress of having to borrow them from the body’s own reserve, particularly from the white blood cell count. White blood cells are a crucial part of our immune system and their optimal activity is essential for the body to provide maximal defense against the invasion of micro-organisms that potentially cause disease. Our enzyme levels must be maintained at any expense to ensure vitality, endurance, and to prevent disease. Enzyme deficiencies can be the cause of circulatory diseases, high blood pressure and other blood vessel related problems. Fat that is not properly digested may be absorbed in the incompletely digested state and cause disease. Enzymes may be used not only to maintain health, but also during detoxification programs. They can be the support system to all systems and to health-promotion processes. The stomach and small intestine have different pH values; this means that enzymes or combinations of enzymes that are active over a wide pH range are the most beneficial. When digestion is sluggish or the enzyme level is low, as is often found in the elderly, the food ferments and causes gas, bloating, constipation, colitis and other problems. Take one to three capsules daily with meals. Please take a full glass of water when taking these capsules for maximum benefit. Note: For maximum effect, this supplement should be taken for some time before the full effect of improvement is experienced. Caution: if you are pregnant, lactating or have an existing ulcer, please consult your healthcare professional before taking this product. It is safe, and no toxicity or side effects have been reported when taking as a dietary supplement. People starting an intake of these compounds in supplement form have reported in some cases an increase of gas, bloating, acne, slight dull headache etc – the symptoms are however temporary and is the body’s way of healing itself. More water must be taken when taking enzymes in supplement form, to assist with the cleansing of the body. The benefits are felt and seen quickly, but maximum effect is only achieved after taking a supplement for some time, and the best results are reported after taking it for at least 12 weeks. Enzymes are required by most body functions and systems – including the digestion and other metabolic processes. 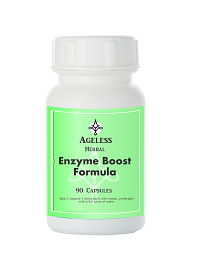 A shortage of enzymes in the body can cause a multitude of problems which can lead to disease. During periods of stress or disease supplementation of enzymes can have a very beneficial effect. Useful when detoxification and balancing of the body is required.